CASE STUDY: What’s Missing From Your KPI Framework? Rhianna’s organisation has a committee for their new KPI Reporting Framework project. And they’ve laid out an approach to consult the right people in developing new measures to align to their six strategic themes. Deadlines are set, senior leaders are supportive, the budget is approved. But chances are, they’ll fail. It sounds like Rhianna and the team have done everything that’s needed to make sure they get great KPIs, quickly. But they’re missing something. They’re missing something very important, something that lies at the root of why most KPI projects fail to deliver performance measures that are fundamentally more useful than all the measures everyone’s groaned about in the past. As you know, Albert Einstein said “We can not solve our problems with the same level of thinking that created them.” We have to think differently. We have to take a fresh perspective. We have to surface and challenge our assumptions. We have to change what we believe. We have to do different things. You cannot get better KPIs and measures with the same approach that created the ones you currently have. Write down your approach to choosing, creating and using performance measures in your organisation. Flowchart it. Note where you have specific proven techniques to design and define measures, to design reports, to interpret measures’ true signals. Note where those techniques are supported by templates. Note how consistently people apply the same approach. Note how engaged they are in the process of measuring and in the measures themselves. 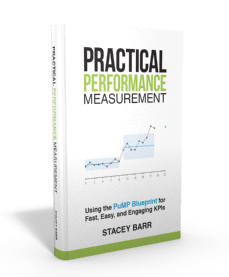 Do you have a REAL approach to performance measurement?